Americans love their pets. Remember during the Katrina rescues, when helicopters would arrive to airlift persons waiting on roofs? Many of these needing assistance were sitting on their porches, positioned on their roofs and crouching in their attics, waiting for help to arrive, accompanied by their beloved cats and dogs. The rescuers often refused to take the animals for many reasons, ranging from public health concerns in shelters to lack of understanding. Some people chose to stay in danger rather than leave their pets behind. Within a year, the Pet Evacuation Transportation Standards (PETS) of 2006 was passed by a bipartisan, and nearly unanimous, Congress. This law marked a societal change in how we view pets. They had now become unofficial members of the family. However, there are still situations in which pets and rescue don’t necessarily go hand in hand. Though the links between abusing animals and people are clear, most shelters for domestic violence survivors are simply unable to take animals, so they have to find other options for the pets. Nuzzles sponsors the Purple Paw program, which places animals in foster care homes until the owners can find new housing and get back on their feet. The article describes how Nuzzles & Co. recently returned to a home to pick up a dog and cat left behind when a woman fled. The pets will remain in foster care until the owner is ready to care again. 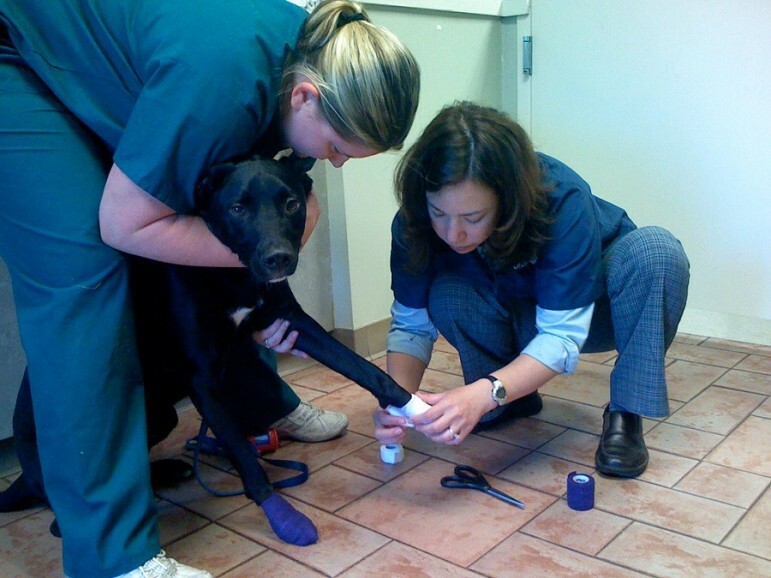 Nuzzles & Co. started their Purple Paws program in August 2012. Since that time, they have sheltered 87 animals. The animals are sometimes kept in the foster home for several months. Another domestic abuse survivor found a new home and was ready to move in, but was unable to afford the $500 deposit required for pets. Again, the Purple Paw program was able to provide the deposit and allow the woman and her young daughter to be reunited with their Shih Tzu. One of my duties…is to answer the hotline calls. Most often, I am talking with people who’ve finally made a decision to leave a very abusive situation. They’re struggling with what they’re gonna do with the children…and then they say, “But I have a pet; I’ve got to take my pet also.” It’s so great to have this program, the Purple Paws project. I’m able to allay their fears immediately…. It’s often the final piece of the puzzle that allows a person to leave a violent situation. A feral young cat who streaked across the Busch Stadium outfield last week has become Rally Cat, and is at the center of a custody battle that includes the nonprofit St. Louis Feral Cat Outreach.